The full size Econoline and Club Wagon Van (and later the E-Series) has been a staple for Ford since its introduction in 1961, helping to revolutionize the automotive market during the process. Not only was the Ford E-Series the bestselling American full size van but at its peak held nearly 80% of the market share in the US. The key reason being that 95% of van sales are for commercial or fleet use with half of this focused on cargo applications. Commercial or utility use is a specialty for the Econoline van. Early Econoline vans were based on the Ford Falcon and where considered compact cargo vans. The early 60s Econoline vans were designed to compete with the Chevrolet Corvair 95 and Volkwagon Type 2 (T2) passenger vans. The original Econoline layout was unique in that a cab over with mid-engine design was implemented. The popularity of this style led to the adoption by both the Chevrolet / GMC Step Van and Dodge A100 and later by Japanese auto makers. With the introduction of the second generation Econoline Van, Ford would implement a new and unique design element that would drastically change not only the full size van market but the recreational vehicle / motorhome segment as well. Like the European market Ford Transit, the 1969 Ford Econoline van would feature an ultra-compact front engine design. This would allow for a more balanced ride and larger V8 engine capacities. Another notable change came when the third generation was introduced in 1975. 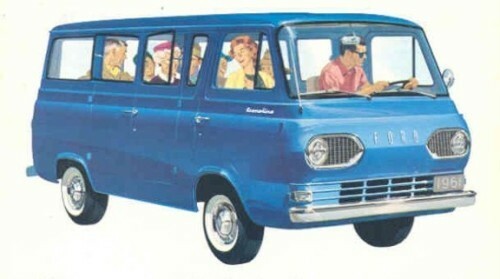 The Econoline was redesigned on a new platform more akin to pickup truck. Changes included a full hood and styling similar to F-Series trucks but more importantly a full frame. This allowed for the chassis to be used for cutaway vans such as ambulances, school buses, box trucks and more. After a long and prosperous run, Ford discontinued the E-Series after model year 2013. The only exception is for use as a chassis for school buses, shuttles, motorhomes, box trucks and other utility vehicles. Taking its place is the full size Ford Transit and supplemental Transit Connect. The Ford Transit has been in production since 1965 and has been Ford’s competing van in the European market going up against the Mercedes-Benz Sprinter. As the US / Canada market has continued to favor more fuel efficient Sprinter style vans, Ford replaced the Econoline with the Transit in 2015. This was also due to the popularity and proven ability in the European market since 1965. Since its introduction in 2015 the full size transit has had a strong placement in the North American region. It has been utilized for the same multitude of uses the Econoline was/is used for including commercial, transport and of course camper conversions with both professional 3rd party companies and DIY private individuals. 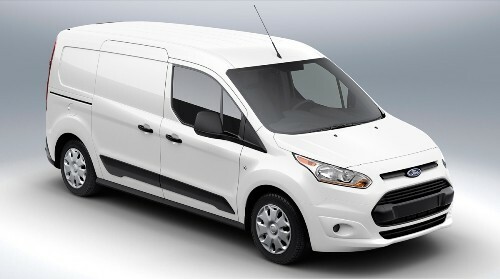 The Ford Transit Connect is a compact MPV version of the full size Ford Transit panel van. The Transit Connect was introduced to the European market in 2002 and has been imported to America since mid-2009. The Transit Connect is used for many purposes outside of camper van conversions. This includes commercial (cargo) purposes which is the Transit Connect’s primary use along with the passenger variant the Ford Tourneo Connect. The Connect was redesigned for model year 2013 which includes many of Ford’s in car technical innovations including MyKey. The 2014 model year will also mark the first time that Ford has sold a minivan with the Transit Connect using the Wagon terminology to mark it.